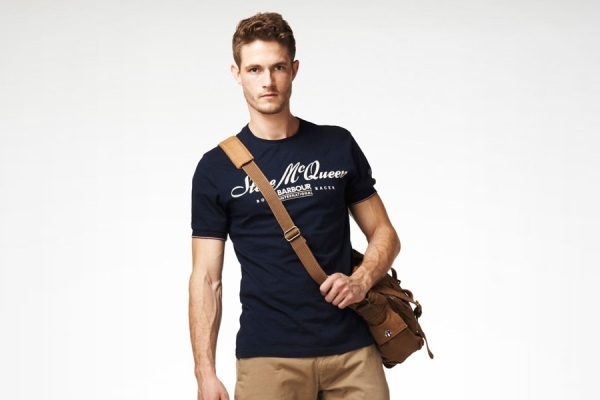 Once more, Barbour pays tribute to the famous movie star with a second clothing line bearing his name, "The Barbour Steve McQueen Collection." The line is inspired by the classic look sported by the King of Cool while on his motocross adventures, the iconic jacket of this household brand name. Actually, each piece in the collection may as well have been taken directly from his own wardrobe: chino trousers, printed t-shirts, washed wax finish jackets, to name a few. Our ultra-cool and totally comfortable spring/summer favourites are the printed cotton tees with a round neckline. The "Grand Prix" model, with McQueen’s face printed on a white background and Barbour’s logo, is one-of-a-kind. The red around the neck and the sleeves contrasts beautifully with the white cotton, adding a sporty and stylish touch. Take your pick from many other attractive items available from $55 each, like the baseball-inspired two-tone retro tee, or the fleece cotton one for the more cold-sensitive.